Malayalam superstar Mammootty, who has given us three blockbuster movies in 2008 so far (Roudram by Ranji Panikkar, Annan Thampi by Hariharan and Twenty:20 by Joshi), will soon don the role of a mahout in Thappana by Akku Akbar, who recently directed the super family entertainer Veruthe Oru Bharya starring Jayaram and Gopika in the lead. Thappana is a Malayalam word which means an elephant used to train wild elephants. In this film, Mammootty will be the owner of a famous elephant, Kannan (which belongs to actor Jayaram). Earlier, the same elephant had featured in Mammootty's Rappakal. Kannan, which recently won the prestigious 'Gajarajapattom' award from Kodannoor Dharmashastha Kshethram, is famous for his calm behaviour and has acted in more than 33 films. 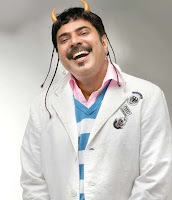 Sources say Mammootty's Thappana will be an elephant-oriented film. Reji Nair pens the script. Thappana will be one of the superstar's biggest movies in 2009. More details are awaited. The superstar is currently in Dubai to attend the Dubai International Film Festival where his internationally reputed film Ore Kadal is being screened.